Yesterday finally saw mine, Alexanders and Eriks extensively converted chaos warbands clash in glorious battle in the warped landscape of the chaoswastes (also known as the kitchen table in my offices basement). We'll get back to the two battles we fought once Alexander is finished writing up the battlereport and we have sorted all of the pictures. What I can say straight away is that this was the first time any of us played a game using the Age of Sigmar rules and that we - all being casual gamers - found it to be quite fun. There's some certainly some issues with the game if you're a "proper gamer" - I can imagine the battles getting repetitive quite fast if you play several times a week. 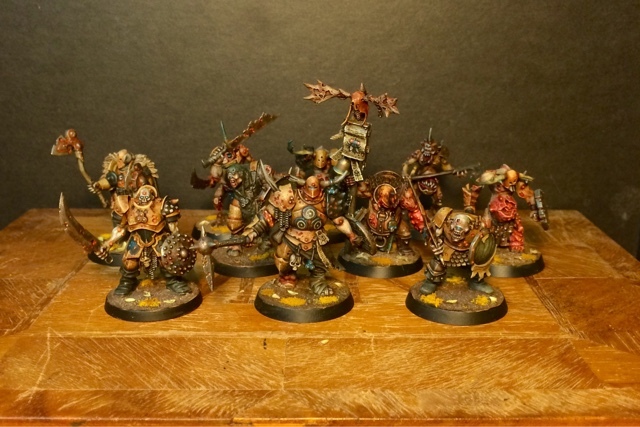 Anyway, today I'd like to properly present my warband - the nurgly followers of Lord Mawgut Gloop. All in all I'm quite happy with how the warband turned out and how they performed in battle. The blightkings are BRUTAL - they may not be fast but they can both take and dish out absurd amounts of punishment if the dicegods are with you. In the future I'd like to add a unit of chaos goblins, some plaguebearers and a big monster of some sort. That's it for today. I'll be back tomorrow with a tutorial for how I painted the Blightking champ and a closer look at the biletrolls. Chaos Goblins, that'll be something to look forward too (I remember the one you did before). Cheers! I did two actually, and put together two more, so a ten gobbo unit shouldn't be to hard to get done. They are all fantastic. I love the colour palette you have used. Thanks! I tried to stay away from those stereotypical greens as much as possible. 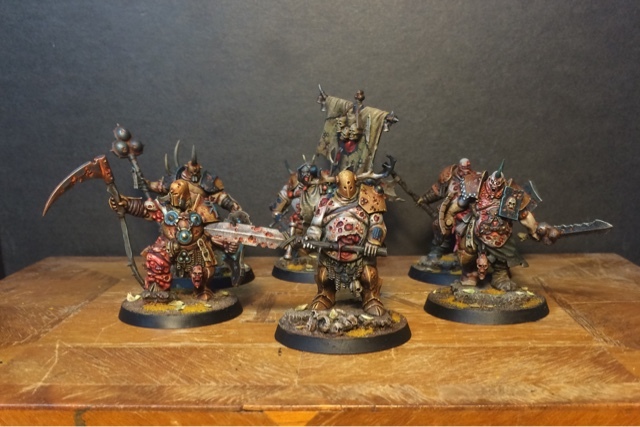 Other than that the warband looks great and I'm looking forward to seeing more from your games :) No khorne or will he come later? Nope. No minotaur yet and no Khorne. To be honest none of us three find Him particularly exiting. At one point everyones favourite Lord of Skulls - Kraut Scientist - was on board to tackle the Blood God, but unfortunately he couldn't make it. 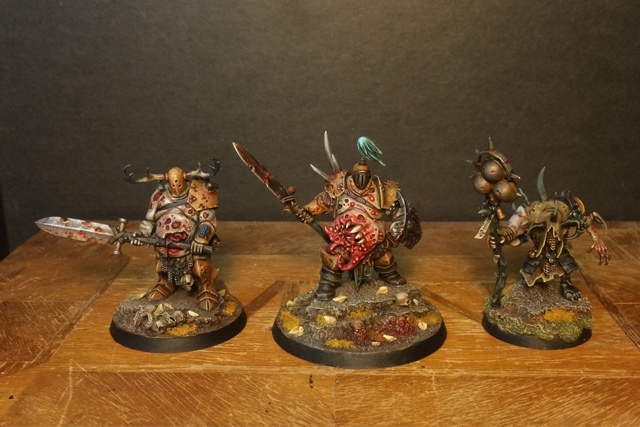 Totally blown away by this warband, really stellar job. Currently realizing my own Nurglich warband, the Brotherhood of Blight (maybe the Blighted Brotherhood?). Based around the RoC army building list and consists of 1 Nurgle Chaos Lord, 6 Beastmen, 3 Chaos Gobbos, 5 Cultists, and a group of 3 Chaos Ogres. Not sure how close this is to the Age of Sigmar list making system for Path to Glory, but your own warband has been a huge impact and inspiration for the push to create my own. Just hope t turns out even half as good as yours. Good luck on your trek through the fetid wastes of chaos, and may you forever be in the favor of the grandfather of rot. Thanks! May grandpa be with you too! Great armyshoot, turned out much better than the one I took of your force. It was great to see them in real life, those blightkings rocked! Those exploding sixes should have been d3 instead of d6, would have been more balanced, but it was fun anyway! I liked the finale in the campain as well with your warriors running up, defending the hill for the sorcerer to advance undisturbed and finish the ritual. Very cinematic! That sounds insane! Which warband were you playing as per chance? Can't wait to see the aftermath photos, this sounds like it was a pretty epic battle! I played tzeentch. Alexander played Slaanesh, and johan ofcourse played Nurgle. I agree - the blightkings are a bit over-the-top. Imagine fighting an even larger unit... The last game was really cool. It seems a good scenario is key when playing AoS. One hell of an achievement. Excellent work! Wow mate, just wow. And chaos gobs? Great choice! Huge accomplishment here! Finishing a project like this and actually being able to play a nice and relaxed game with some pals is probably the greatest achievement in this hobby. It sounds easy but it's been ages since I finished and played with some models, so kudos to you to push hard on it and get id done in time! I am looking forward the battle pics now! This is just such an incredible endevour to get back to after a week in Norway. Pure eye-candy and in some weird way a walk down memory lane being the Chaos Wastes of the good Old World. 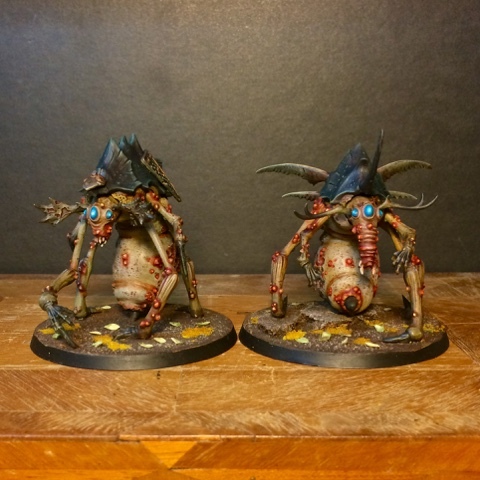 Hey, I'm very late to the party, but I randomly stumbled upon this blog the other day and I'm loving it, made me go back to some of the classic Nurgle Champions of Chaos I have for my (very fledgling) 8th ed. army and paint some random checkerboard shoulder pads and extra pustules... I've also been convinced to move up my purchase of a box of Blightkings instead of the converted Mutalith Vortex Beast I was planning. One question - how do you paint the rust on the weapons and armour?? I need some colour splashes on my very metallic looking warriors and this seems just the ticket!